One of six children born to the lower middle class family of Francesco Antonio and Agnes Morbioli, Ludovico spent his early adulthood in a dissolute life that included gambling, violence and a lot of heavy drinking. Married to Lucia Tura. While living in Venice, Italy in 1462, Ludovico was struck with a serious but unspecified illness, and was cared for at the hospice run by the Canons Regular of Saint Savior. This brush with death led to a re-examinination of his life, a conversion experience, and a determination to do penance for his earlier life. From then on he wandered the streets, preaching penance, and living in complete poverty. 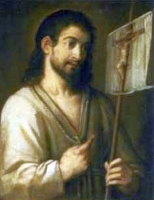 He carried a staff with a crucifix, and always a plain gray shirt or a white shirt with a cross on the chest, which led many to associate him with the Carmelites, though he was never a member of any religious order. He returned to Bologna, Italy in 1470 and continued his life as a street preacher there. He wandered through Modena and Ferrara, Italy, preaching; people would gather around him to mock him as he looked like a wild man with wild hair and unkempt beard, but then his preaching would keep them listening. He finally returned to Bologna to spend his remaining in the basement of Palazzo Lupari, which he fitted out like a monk‘s cell; it was later converted to an oratory. Blessed John Baptist Spagnuolo wrote a poem about his life. Born to a pious family. In 1857 she married Joaquín Muñoz del Caño, a violent, unfaithful man; Maria responded by praying for him until he finally turned his life around. Widowed in 1881. In 1882, with the help of Cappuccin Father Barnabas Astoraga and some like-minded women friends, Maria turned her home into a combination school and clinic, caring for and educating children too poor to have other resources. On 8 May 1884 she and the other women began to live in common at the convent of Our Lady of Victory of Antequera, Spain. They formed the core of the Hermanas Franciscanas de los Sagrados Corazones (Franciscan Sisters of the Sacred Heart) which Maria helped found; they received approval of Bishop Miguel Salazar Gomez on 10 July 1884, and Maria took the name Carmen of the Child Jesus. The Sisters received approval of Pope Leo XIII on 3 May 1902, and continue their good works today. Born to the Italian nobility, the eldest son of the Count Liverotto of Ferretti and Lady Alvisia. At age 18 he left his worldly position behind and joined the Franciscan Friars Minor at the convent of San Francesco in Ancona, Italy. Received visions of the Blessed Virgin Mary. Had the gift of healing through his prayers. Priest. Superior of the convent in Ancona in 1425. Franciscan provincial-vicar of Piceno, Marches of Ancona, Italy from 1434 to 1449. Founded convents in San Severino Marche, in Ascoli Piceno, and Osimo, Italy. Friend of Saint James of the Marches who, in 1438, wanted Gabriel to help in his evangelization of the region of modern Bosnia, but the people of Ancona convinced Pope Eugene IV to order the friar to stay in Ancona. Retiring from his position as provincial-vicar, Gabriel became superior in his home convent from 1449 to 1452 when he retired from that to live his remaining years as a simple, prayerful friar. Roman general (stratelates) and covert Christian during a time of persecution. Exposed as a Christian, a military tribunal decided he was a good soldier who had made a mistake, told him to reconsider, and set him free; he promptly burned down a pagan temple. Arrested again, he was ordered to apostatize, then tortured by having his flesh torn off; he responded by reciting the Psalms. Martyr. Saint Theodore Tyro is almost certainly the same person as Theodore Statelates. The Tyro story describes the soldier as a recruit, the feast day is 9 November, and the region is slightly different, but the story is the same. Son of George and Anne Napper; his father taught at All Souls College. Great-nephew of William Cardinal Peto. Educated at Corpus Christi College in Oxford; seminarian at the English College, Douai, France. Ordained in 1596, he returned to England to minister to the covert Catholics in Oxfordshire, England beginning in 1603. He travelled the countryside on foot, and apparently lived with his brother William who put himself in great danger by hiding him. He was betrayed and arrested on 19 July 1610 when he was found carrying a breviary, holy oils, a reliquary, and a pyx containing two consecrated Hosts; when he was later searched, the reliquary and pyx had disappeared. George was sent to Oxford Castle where he was convicted of the crime of priesthood. While in prison, he ministered to fellow prisoners; this was considered an additional crime. He was offered a commutation of his sentence from death to exile if he would sign an oath of allegiance against the pope; he declined. Martyr. The oldest and first in rank of the four basilicas of Rome, Italy. The name is derived from the Laterani family, on the site of whose palace the basilica stands. Constantine presented this palace to the Church. Its annual celebration throughout the Latin Church is a sign of love and unity with the Papacy and Pope. 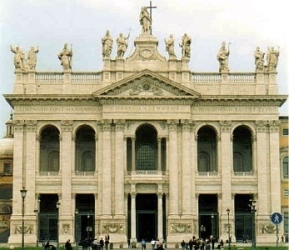 The original church building, probably adapted from the hall of the palace, was dedicated to the Saviour, and from its splendor was known as the Basilica Aurea. Though several times destroyed and rebuilt, the basilica retained its ancient form, being divided by rows of columns into aisles and having an atrium with colonnades. The tasteless restoration of the 17th century changed its appearance. A monastery was formerly between the basilica and the city wall of which the cloister still remains. The original apse survived until 1878, when it was destroyed and a deeper apse built. The ancient mosaics have been preserved. The high altar, which is of wood and is believed to have been used by Saint Peter, is now encased in marble. In the upper part of the baldachinum are the heads of the Apostles, Peter and Paul. The baptistery is an octagonal edifice with porphyry columns. The font is of green basalt. This basilica has been the cathedral of Rome since the 4th century. Son of a poor fisherman. Adriatic fisherman and farmer in his youth. Sailor. In 1468, while on a trip to Venice, Italy he heard a sermon by Blessed Simon of Camerino; he was so moved that he gave up his worldly life and became an Augustinian lay brother at the monastery of Monte Ortono near Padua, Italy. He worked in the garden, monastery and sacristy. After 15 years he was transferred to the monastery of San Cristoforo on Murano off the shore of Venice; he lived there the rest of his life. Famous for his gift of infused knowledge, that is, knowing things that there was no reason to suspect he had learned. A light was said to shine over is cell, and he was known as a miracle worker. Had a special devotion to the Eucharist and spent his spare time in adoration. Son of the Irish chieftain Sesenen in County Meath. Baptized by and a disciple of Saint Patrick, accompanying him in his travels and missions. Noted choral singer and arranger for liturgical music, he was called Patrick's psalm-singer. Evangelized the provinces of Clare, Kerry, and Connaught. Abbot of Drumlease for twenty years. Assisted in compiling the Senchus Mor, the Irish Code of Laws. Present at the synod which recognized the See of the Apostle Peter (Rome, Italy) as the final court of appeal in difficult cases. 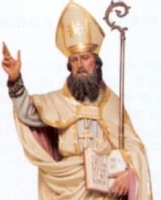 Succeeded Saint Patrick as bishop of Ireland. When Saint Dionysius of Milan was driven from his diocese by Arians, he fled to Armenia where he was befriended by Aurelius. When Dionysius died, Aurelius took his remains back to Milan where he remained as a friend to Saint Ambrose of Milan. Bishop of Riditio in Armenia. Member of the Salesians of Don Bosco, taking his vows on 15 August 1929. Studied mechanics and religious formation in Italy. Supervised a mechanics laboratory in the college of Madrid, Spain. Martyred in the Spanish Civil War. Missionary to and first bishop of Bourges, France. Legend says he was a disciple of the Apostles who sent him as a missionary to Gaul (modern France), but we now know that he lived in the third century. Became a monk as a young man. Bishop of Verdun, France c.500. Converted all the residents in his diocese, wiping out paganism in the area. Founded a college for priests. Known as a miracle worker. A great Benedictine abbey in Lorraine, France was later named for him. Priest in the diocese of Wloclawek, Poland. Martyr. Son of a fifth century Pictish chieftain. Soldier and warlord in the area of modern Scotland who gave up his sword to become a monk in Wales. Founded a monastery on Anglesy Island; it was later known as Llanbabon, based on a variation of his name. Dominican nun in Veszprem, Hungary. Novice mistress to Saint Margaret of Hungary. Prioress. Reputed stigmatist. Given to ecstasies, and lilies of light grew from her hands during prayers. Seventh-century nun. May have been the daughter of Emperor Maurice of Constantinople. A group of ten Catholic Christians who tried to defend an image of Jesus over the Brazen Gate of Constantinople from an attack by Iconoclasts during the persecutions of emperor Leo the Isaurian. The group of was seized by soldiers, condemned by judges for opposing the emperor, and martyred. The only details that have survived are three of their names - Julian, Marcian and Maria.